Italy endorsed China’s ambitious “Belt and Road” infrastructure plan on Saturday, becoming the first major Western power to back the initiative to help revive the struggling Italian economy. 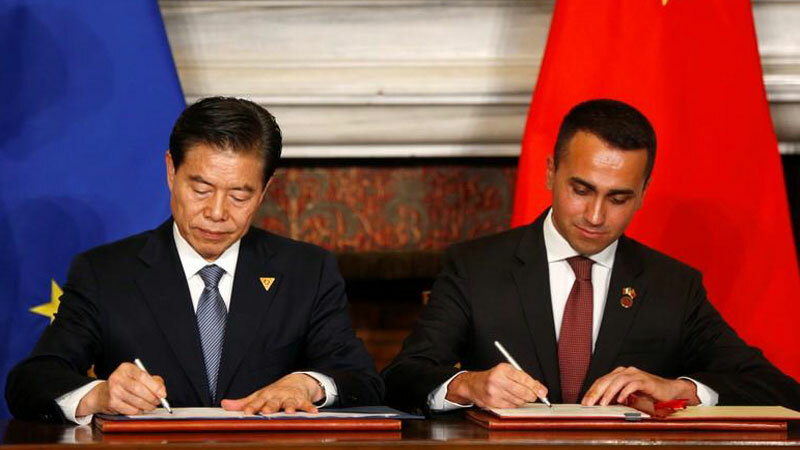 Saturday’s signing ceremony was the highlight of a three-day trip to Italy by Chinese President Xi Jinping, with the two nations boosting their ties at a time when the United States is locked in a trade war with China. The rapprochement has angered Washington and alarmed some European Union allies, who fear it could see Beijing gain access to sensitive technologies and critical transport hubs. Deputy Prime Minister Luigi Di Maio played down such concerns, telling reporters that although Rome remained fully committed to its Western partners, it had to put Italy first when it came to commercial ties. “This is a very important day for us, a day when Made-in-Italy has won, Italy has won and Italian companies have won,” said Di Maio, who signed the memorandum of understanding on behalf of the Italian government in a Renaissance villa. Taking advantage of Xi’s visit, Italian firms inked deals with Chinese counterparts worth an initial 2.5 billion euros ($2.8 billion). Di Maio said these contracts had a potential, future value of 20 billion euros. The Belt and Road Initiative (BRI) lies at the heart of China’s foreign policy strategy and was incorporated into the ruling Communist Party constitution in 2017, reflecting Xi’s desire for his country to take a global leadership role. The United States worries that it is designed to strengthen China’s military influence and could be used to spread technologies capable of spying on Western interests.